In our culture there is a job for art, because we can't experience reality anywhere else. A wall construction of a large intaglio print with wooden supporting slat and a copper basket containing 12 smaller prints. The construction is designed to be hung unframed and reinforced by a Plexiglas backing sheet with wall mount..
Color soft ground etching with foul biting and hand staining. Image size: 20 x 18"; paper size: 27 x 21". Edition 10. Color hard ground etching with foul biting and hand staining. Image size: 14 x 14"; paper size: 25 x 19½". Edition 10. Hard ground etching with drypoint and color hand staining. Image size: 29½ x 21½"; paper size: 29½ x 21½". Edition 10. Color soft ground etching with hand staining. Image size: 12 x 16"; paper size: 19½ x 25". Edition 10. Color soft ground etching with hand staining and attached gampi strip. Image size: 21½ x 27½"; paper size: 21½ x 27½". Edition 10. Color hard ground and soft ground etching with hand staining. Image size: 21½ x 27¼"; paper size: 21½ x 27¼". Edition 10. Color hard ground etching with drypoint and hand staining. Image size: 17¾ x 21¾"; paper size: 19½ x 25". Edition 10. Color soft ground etching with hand staining and chine colle. Image size: 27 x 21½"; paper size: 27 x 21½". Edition 10. Color soft ground etching with drypoint and hand staining. Image size: 25 x 19½"; paper size: 25 x 19½". Edition 10. Portfolio of 26 color etchings with tarlatan chine collé. Image size: 3 x 3"; paper size: 13 x 13". Edition 15. Soft ground etching with spit bite aquatint and tarlatan chine collé, printed from one plate. From Type, a portfolio of twenty-six etchings. Color spit bite on hand-dropped aquatint with tarlatan chine collé, printed from three plates. From Type, a portfolio of twenty-six etchings. Flat bite with aquatint and ink-dipped tarlatan chine collé, printed from one plate. From Type, a portfolio of twenty-six etchings. Color spit bite aquatint with ink-dipped tarlatan chine collé, printed from one plate. From Type, a portfolio of twenty-six etchings. Drypoint with tarlatan chine collé, printed from one plate. From Type, a portfolio of twenty-six etchings. Spit bite on hand-dropped aquatint with color spit bite aquatint and tarlatan chine collé, printed from two plates. From Type, a portfolio of twenty-six etchings. Drypoint with aquatint and tarlatan chine collé, printed from one plate. From Type, a portfolio of twenty-six etchings. Color spit bite aquatint with soft ground etching and tarlatan chine collé, printed from four plates. From Type, a portfolio of twenty-six etchings. Color drypoint with tarlatan chine collé, printed from two plates. From Type, a portfolio of twenty-six etchings. Color spit bite aquatint with soft ground etching and tarlatan chine collé, printed from three plates. From Type, a portfolio of twenty-six etchings. Drypoint with color hard ground etching and tarlatan chine collé, printed from two plates. From Type, a portfolio of twenty-six etchings. Color aquatint with tarlatan chine collé, printed from two plates. From Type, a portfolio of twenty-six etchings. Image size: 1 3/4 x 3"; paper size: 13 x 13". Edition 15. Aquatint with hand-painted tarlatan chine collé, printed from one plate. From Type, a portfolio of twenty-six etchings. Color aquatint with drypoint and tarlatan chine collé, printed from three plates. From Type, a portfolio of twenty-six etchings. Color spit bite aquatint with soft ground etching and tarlatan chine collé, printed from two plates. From Type, a portfolio of twenty-six etchings. Aquatint with drypoint and tarlatan chine collé, printed from two plates. From Type, a portfolio of twenty-six etchings. Color spit bite aquatint with drypoint and tarlatan chine collé, printed from two plates. From Type, a portfolio of twenty-six etchings. Color spit bite aquatint with tarlatan chine collé and dab of blue ink, added after printing; printed from one plate. From Type, a portfolio of twenty-six etchings. Color aquatint with soft ground etching, aquatint, and tarlatan chine collé, printed from two plates. From Type, a portfolio of twenty-six etchings. Color spit bite aquatint with hard ground etching and tarlatan chine collé, printed from two plates. From Type, a portfolio of twenty-six etching. Color drypoint with shaped tarlatan chine collé, printed from three plates. From Type, a portfolio of twenty-six etchings. Color spit bite aquatint with tarlatan chine collé, printed from three plates. From Type, a portfolio of twenty-six etchings. Color drypoint with tarlatan chine colle, printed from four plates. From Type, a portfolio of twenty-six etchings. Color drypoint with aquatint and tarlatan chine collé, printed from two plates, one diagonally cut in half. From Type, a portfolio of twenty-six etchings. Portfolio of six aquatints and a textual page in an artist-designed box. Image size: each 9 1/4 to 25 x 18 1/2 to 23 1/4"; paper size: each 9 1/4 to 25 x 18 1/2 to 23 1/4". Edition 20. Image size: each 14 x 14"; paper size: each 21 x 20". Edition 15. Image size: each 13 x 11¾"; paper size: each 19 x 18". Edition 20. Portfolio of eight color aquatints with etching, drypoint, embossing and woodcut. Image size: various; paper size: each 11 x 11". Edition 25. Portfolio of seven color aquatints. Image size: varies; paper size: varies. Edition 40. Image size: 10 x 17¾"; paper size: 14 x 22". Edition 40. Image size: 19¾ x 14"; paper size: 24 x 18". Edition 40. Image size: 19¾ x 17¾"; paper size: 24 x 22". Edition 40. Image size: 16 x 29¾"; paper size: 20 x 33¾". Edition 40. Image size: 18 x 18"; paper size: 22 x 22". Edition 40. Image size: 22¾ x 20"; paper size: 27 x 24". Edition 40. Image size: 17¾ x 19¾"; paper size: 22 x 24". Edition 40. Seven color woodcuts with hand-painted borders in a portfolio designed by the artist. Image size: each 10 1/4 x 14"; paper size: each 12 x 16". Edition 30. Published by Crown Point Press and printed by Lee Guiyin at the Duo Yun Xuan Workshop in Shanghai, China. Color woodcut printed on silk backed with paper. Image size: 21¾ x 17"; paper size: 21¾ x 17". Edition 30. Published by Crown Point Press and printed by Tadashi Toda at Shi-un-do Print Shop, Kyoto & Qin Yun Hu and Jiang Ming, Duo Yun Xuan Workshop, Shanghai, China. In 2005, in Time magazine, Richard Lacayo called Richard Tuttle “the man of small things.” Lacayo was reviewing Tuttle’s retrospective at the San Francisco Museum of Modern Art, which, he said, “sends you home with your senses briskly reconditioned.” Tuttle, he added, “has been increasingly recognized as a genuine, if highly idiosyncratic, American master.” The exhibition traveled to the Whitney Museum of American Art in New York, the Des Moines Art Center, the Dallas Museum of Art, the Museum of Contemporary Art in Chicago, and the Museum of Contemporary Art in Los Angeles. Tuttle was born in 1941 in Rahway, New Jersey, and lives in New York City and New Mexico. He received a BA from Trinity College in Hartford, Connecticut, in 1963, and while in Hartford spent time in the Wadsworth Atheneum and became friendly with the curator of paintings there, Sam Wagstaff. Wagstaff, who organized what is considered the first exhibition of minimal art, introduced Tuttle to art ideas and also to many artists. In 1964 Tuttle moved to New York. He telephoned the painter Agnes Martin and asked if he could meet her. She not only introduced him to the director of the legendary Betty Parsons Gallery but also became an inspiration to him and a lifelong friend. Tuttle began working at the Betty Parsons Gallery as a gallery assistant in 1964. His first one-person exhibition was at the gallery in 1965. He showed there regularly until Parsons died in 1982. In 1966 Tuttle spent a year in Paris through a grant that provided a studio and a stipend. In 1968 he had his first show in Europe, at the Galerie Schmela in Düsseldorf. That same year, at the Betty Parsons Gallery he showed shaped, dyed, unstretched canvases now considered key works of a movement variously called postminimal art, process art, or antiform. In 1969 his work was included in “When Attitudes Become Form” organized by the Kunsthalle in Bern. In 1972 Tuttle showed in the Projects Room at the Museum of Modern Art in New York, and in 1975 the Whitney Museum of American Art gave him a ten-year survey. The exhibition traveled to the Otis Art Institute (now the Otis College of Art and Design) in Los Angeles. In 1979 the Stedelijk Museum in Amsterdam mounted a survey of his small collage works. He has had many other one-person shows and has been in many important group shows, including “Drawing Now,” organized by the Museum of Modern Art in New York in 1976. Tuttle has said that all his work is drawing centered. He made his first prints, woodcuts, as part of an artist’s book, in 1965. Tuttle has created prints and artist’s books continuously during his career, many of them published by Brooke Alexander Editions, New York. 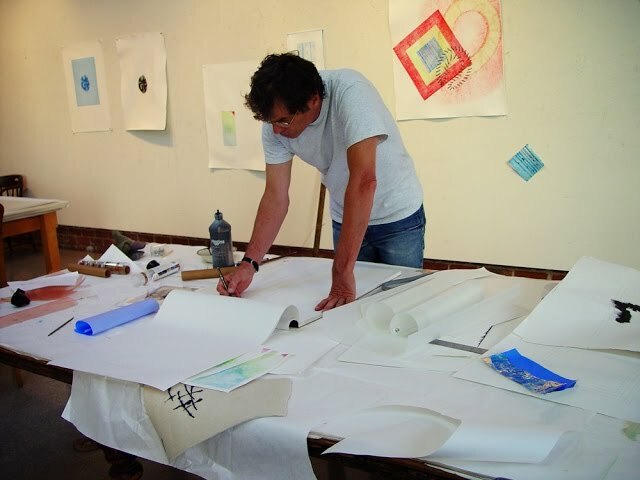 Crown Point Press has published etching projects with him since 1998. His paintings are in many museum collections, including the Albright-Knox Art Gallery in Buffalo, the Fogg Art Museum at Harvard University, the Museum Ludwig in Cologne, the Metropolitan Museum of Art in New York, and the Wadsworth Atheneum in Hartford, Connecticut. He is represented by Pace Gallery in New York.